Image after Petr Exner's Vexilologický Lexikon prapory obcí ÈR (1996) - Nepomuk, Plzeò-jih district, Plzeò region - adopted 13 Feb 1996. Nepomuk: the horizontal flag is diagonally white over blue (Bhutan-like) with the five yellow six-pointed stars in the canton. Stars on its flag are remark of St. John Nepomuk, but not the arms. 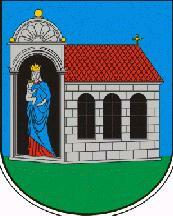 A small representation of St John was once in a medallion, which was placed over the church gate (I mean that church depicted in Arms, not a real building), but only Saint in Nepomuk Arms today is Holy Virgin with Child. by Ivan Sache, 7 July 2000, after image from this site, reported by Jarig Bakker, 7 July 2000. This municipality in Plzeò-jih okres, in southwest Czechia, has a vertically presented flag. The CoA on the same page differs completely from it. Is that John Nepomuk, the patron-saint of Bohemia, who is depicted on the CoA? Jarig Bakker, 7 July 2000. Nepomuk (about 30 km south of Plzeò) is the birthplace of the Vicar-General of the Prague Episcopal Court, John of Nepomuk (means: 'born in Pomuk'), who was hurled into the Vltava from the Charles Bridge on 20 March 1393. After the Battle of the White Mountain (1620) the cult of John of Nepomuk was made the main plank of the Jesuits' programme to re-catholicise the Bohemian people. Kilian Ignaz Dienzenhofer built a pilgrimage church on the site of the former birthplace of the Blessed John of Nepomuk (later canonized) - From: Nagels's Czechoslovakia Travel Guide, Geneva, 1959. Jarig Bakker, 10 July 2000.
image from this site, reported by Jarig Bakker, 7 July 2000.